What About the Boulevard? 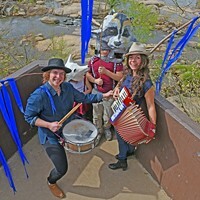 | Cover Story | Style Weekly - Richmond, VA local news, arts, and events. 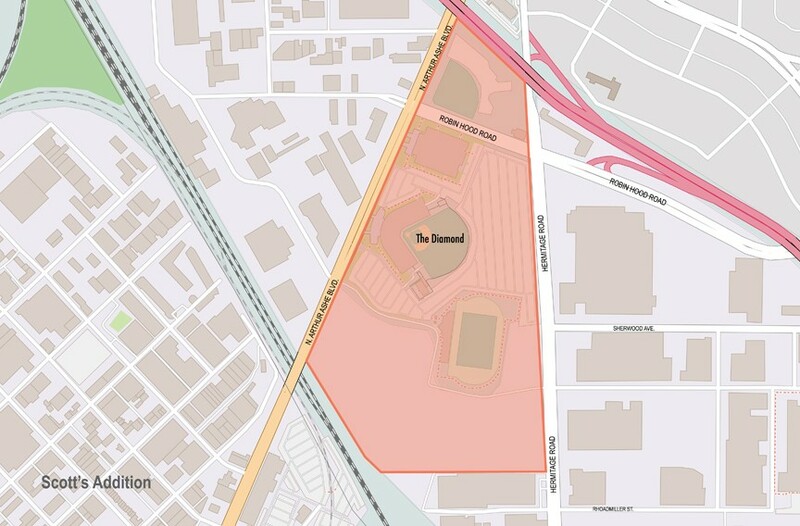 Around the Diamond, home of the Richmond Flying Squirrels minor league baseball team, is one of the few publicly owned urban tracts of land in the United States. The site pulls in $400,000 in total tax revenue a year to the city when its total economic impact could be $339.3 million a year, according to one consultant’s report. A pot of development gold lies at the end of a high-traffic rainbow of swooping lanes that brings together interstates 95 and 64. From this intersection, traveled by 125,000 vehicles a day, you'll take the Boulevard exit. Turn right at the Clarion Hotel and pass Wawa — the newest development in this area, which opened to great fanfare Oct. 18. Across from the Greyhound bus station, on your left, is the Diamond, home of the Richmond Flying Squirrels. The baseball team's staff members are busy inside. Spring arrives March 20, and opening night is now two weeks away for the Double-A affiliate of the San Francisco Giants — Thursday, April 4. There will be fireworks. In a year, there may be another celebration to anticipate — or perhaps a moment of recognition to mark the bittersweet amazement that this concrete marvel has withstood upgrades and patching-up, the departure of the Braves and the arrival of the Squirrels. The Diamond will turn 35 years old in April 2020. Along the way, the debate about baseball on what is now Arthur Ashe Boulevard nearly became a cottage industry in Richmond. There have been consultants' studies, myriad proposals, regional maneuvering and hearty arguments, City Council resolutions, editorials, protests, polls, a task force and community meetings. Should it stay? Should it go? Who should pay? 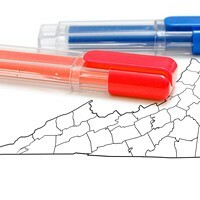 Voters in Style's Best of Richmond poll once declared that the "Local Issue You're Most Sick of" was "Proposals for Relocating the Diamond." Hardly anyone bothers arguing about it anymore. Three Richmond mayors have filled portions of their terms addressing the puzzle, but ultimately leaving it unsolved: Rudy McCollum, L. Douglas Wilder and Dwight Jones. A fourth mayor, Levar Stoney, is at bat. Fear not, everyone seems to agree, the debate over baseball on the Boulevard has run its course. Signs held high by impassioned voters at City Council meetings likely are rotting in the landfill. Baseball has survived in this part of town for 65 years, since the Richmond Virginians played at Parker Field. What also hasn't changed, fundamentally, is the land around the Diamond. It's a rarity in landlocked Richmond, "arguably the most valuable development site in the city of Richmond," says Bill Pantele, real estate and business lawyer and a former City Council president. Beyond Richmond, it's "one of few underdeveloped, publicly owned urban tracts of land in the United States," the city's Department of Economic and Community Development says. This is hot property. Yet these 61 acres lie in wait. "The site generates no more than $400,000 in total tax revenue to the city," the city wrote in 2016, citing an analysis by the Pittsburgh-based consulting firm Tripp Umbach — when its economic impact could be reaching $339.3 million a year. For now there is no development or growth. There is fencing, tall grass and a parking lot that's empty most of the year. 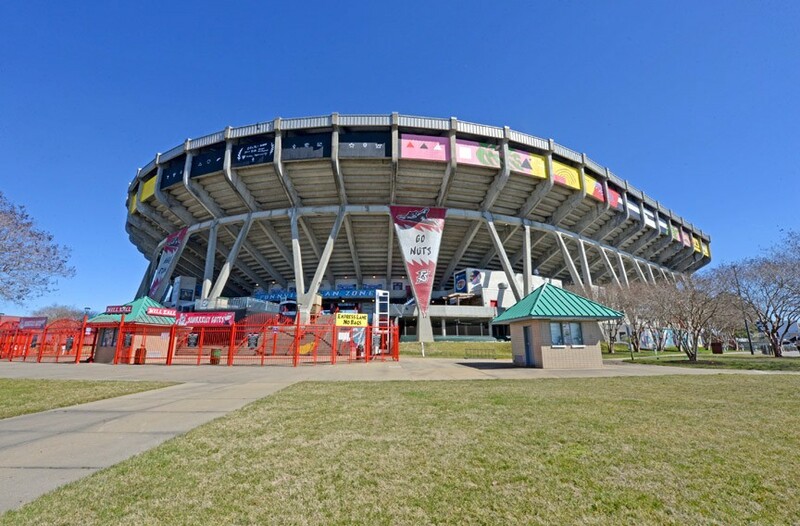 If you stand outside the south end of the stadium, just beyond right field, you can see a vast expanse behind a padlocked gate, straight through to the Cookie Factory Lofts and the dome atop the Science Museum of Virginia. "The development industry is just waiting for that property to be made available for development," Pantele says. City officials offered up the Boulevard property as part of a bid for Amazon to locate its second headquarters here. Though it called the site unabashedly urban, Richmond was unsuccessful in luring the mega-corporation. 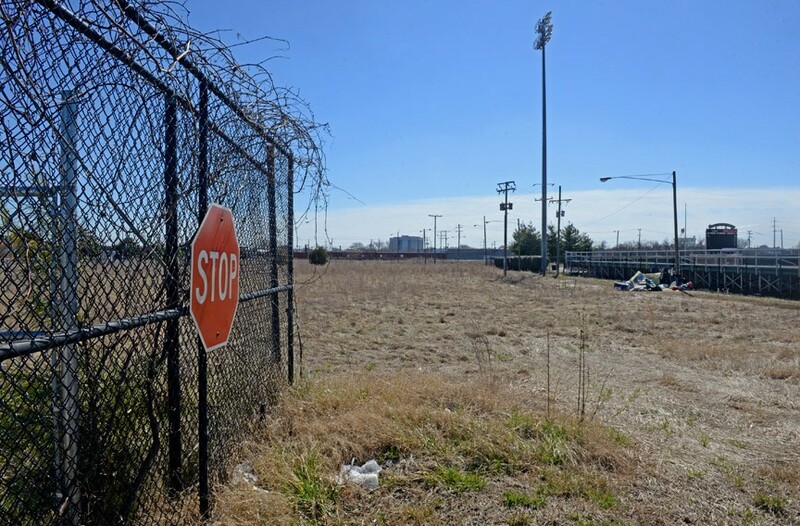 Richmond's ballpark remains surrounded by a field of dreams. The Richmond Braves played at Parker Field beginning in 1966 before their new home, the Diamond, opened for the 1985 season. Richmond and the counties of Chesterfield and Henrico built the ballpark for $8 million, with half contributed by a regional entity, the Richmond Metropolitan Authority, and the other half coming from donors. After 16 years, the ballpark was showing signs of age in 2001. "It's leaking, cracking, creaking, and if you're in the wrong seat, downright uncomfortable," writer Harry Kollatz Jr. described in Richmond magazine. The Braves begin talking about a renovation and wondering about a new stadium. The regional authority was poised to make an upgrade. City Council decided to study the long-term ballpark needs in 2001, with City Manager Calvin Jamison responsible for figuring out the viability of a new stadium. 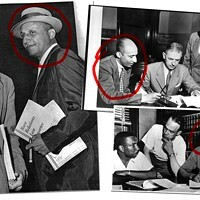 Jamison's position as city manager existed under a different form of government before the Richmond's city charter change, when the mayor, then Rudy McCollum, was selected by City Council from among its members. While options for the ballpark were being considered, a delegation of civic leaders, business owners and elected officials prepared for the Richmond Chamber's 2002 intercity visit — an annual trip to another city to study urban planning approaches. The Diamond is on the avenue whose name recently changed to Arthur Ashe Boulevard. This time, it was to Pittsburgh, where PNC Park had opened the year before, in the spring of 2001, for the city's Major League Baseball team, the Pirates. The stadium was beautiful and gleaming. Jamison liked what he saw. As one person on the trip recalls, Jamison immediately began chatting up other members of the delegation about a new ballpark for Richmond. What if they could build a new stadium, beside the James River, next to the Federal Reserve Building downtown? It is from these moments when you can trace the beginning of the uncertainty about the future of baseball in Richmond. Visions of new stadiums danced in heads. Proposals began to spring up about relocating the ballpark. 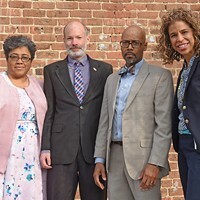 A group of business owners known as Richmond Ballpark Initiative, or R.B.I., worked with the city in 2003 to explore locations for a new stadium — among them such sites as Manchester, Fulton, Mayo Island and Shockoe Bottom. This didn't sit well with the counties. McCollum, a former official on the intercity trip recalls, also was less than thrilled that Jamison's idea had thrown a wrench into the counties' plan to renovate the stadium. Regional officials had little interest in footing the bill for a ballpark farther into Richmond that cost $55 million to $65 million. And along the way, pressure was increasing from the Richmond Braves, whose contract was coming to an end in 2004. The debate grew complex. Virginia Commonwealth University entered the picture, with the idea that it might purchase the Diamond. Not much has changed at the property in recent years. Many interested parties are waiting and watching the property now occupied by the state’s Alcoholic Beverage Control warehouse next to the Diamond. The warehouse could be moving. A new mayor, former Gov. L. Douglas Wilder, came onto the scene with his own priorities and another big public-private project under debate, a new downtown performing arts center, aka CenterStage. 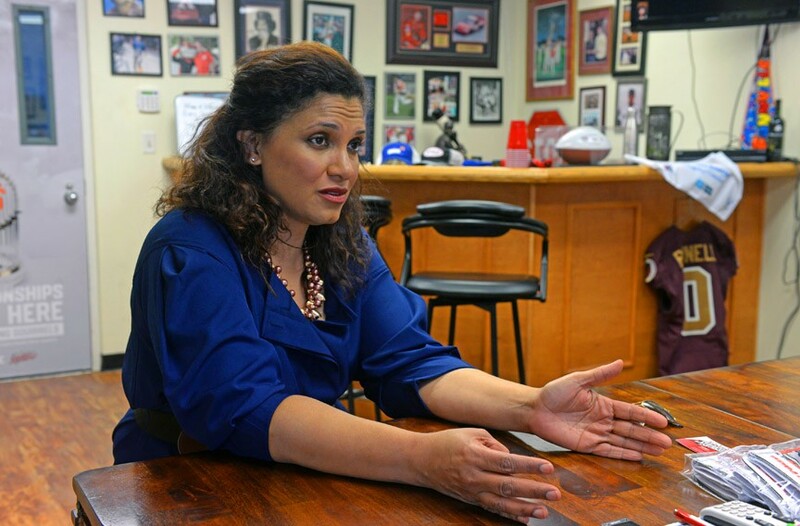 He asked his chief of staff, Paul Goldman, to study the idea for a ballpark in Shockoe Bottom. "I strongly recommended against it," Goldman wrote in a Style Back Page opinion. "His review agreed." Life moved on. So did the Braves. When the 2009 baseball season rolled around, they were playing at a new stadium built in Gwinnett County, Georgia. Flash forward through more attempts to move the ballpark and a group of locals who worked with a developer to come up with a renovated ballpark in the same area with development around it. The Greater Richmond Chamber convened a task force in 2012 focused on moving baseball to the Bottom. In 2015, Jones and his chief of staff, Grant Neely, roped the backers of a proposed independent, regional children's hospital — predominantly philanthropists Bill and Alice Goodwin — into the issue. They put forth the idea that the hospital would be valuable to the Boulevard — but only if the Diamond was gone. The hospital proposal eventually was pulled. Then in 2016, the city asked for developers to submit ideas for the 61-acre site — not including the Sports Backers stadium there. To respond, the city asked for experience "with urban mixed-use, mixed-income redevelopments exceeding investment of $500 million." There were six proposals. The timeline called for presentations to city staff in March 2017. Nothing came of it. These days, the political focus on big development has shifted to a 10-block area downtown, where a group of investors pitched a $1.4 billion development plan that includes a replacement for the Coliseum, hotel, housing, retail and other amenities. To help pay for it, the city proposes drawing a boundary around 80 blocks of downtown to form a tax-increment financing district. From that area, taxes are frozen at the current rate. Any tax growth from that area over that rate, or any taxes from new development within that area, known as a TIF district, would be committed to the project for 30 years. It's such a complex deal that it's been in the works for more than two years. Many questions have gone unanswered. No financial feasibility study has been released from the city's financial adviser, Davenport & Co. The identities of investors and other details have been kept secret. At a recent question-and-answer event called Mayorathon, Stoney said that behind-the-scenes negotiations with lawyers would last into the summer. Two weeks ago, he introduced a budget that must be balanced with an increase to the real-estate tax, from $1.20 to $1.29 per $100, and the creation of a cigarette tax of 50 cents a pack. City Council is studying the budget for the next six weeks. No one is talking much about the Ashe Boulevard site, or the taxes it might generate. And it's unclear what, exactly, is happening. During a reporter's visit to the Department of Economic and Community Development on a recent Friday, most folks had left for the day. But an official suggested sending an email. That was answered by an initial email from the interim director, promising a response, but none came. A phone call went unreturned. An interview request went unanswered. And the only news to emerge publicly in the last year has been that the city offered up the property to Amazon in its bid, through the Greater Richmond Partnership, to land its second headquarters. Local media outlets retrieved as much information as they could using Freedom of Information Act requests. Its pitch for "Amazonians" called the property "unabashedly urban," and touted the transportation, livability, infrastructure and other strengths of the site. Amazon ultimately chose New York and Northern Virginia. Today, developers are waiting for the property to go back on the block. But will the city act as a developer, trying to dictate how the area will be used? Or will it let the developers be moved by the market, letting the buyer determine the highest and best use and getting out of the way? Just down the Boulevard, within walking distance, Scott's Addition has flourished mostly through an initial historic designation and natural development that followed. 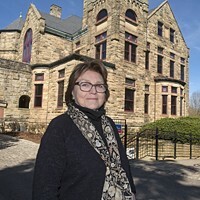 "I still see this as the highest potential revenue-generator for the city, and in turn, for schools," City Councilwoman Kim Gray says, during a cold weekday morning on the property in early March. The 2nd District she represents includes this land. The 2008 consultants' study crunched the numbers for a scenario in which a ballpark is rebuilt on the Boulevard site. 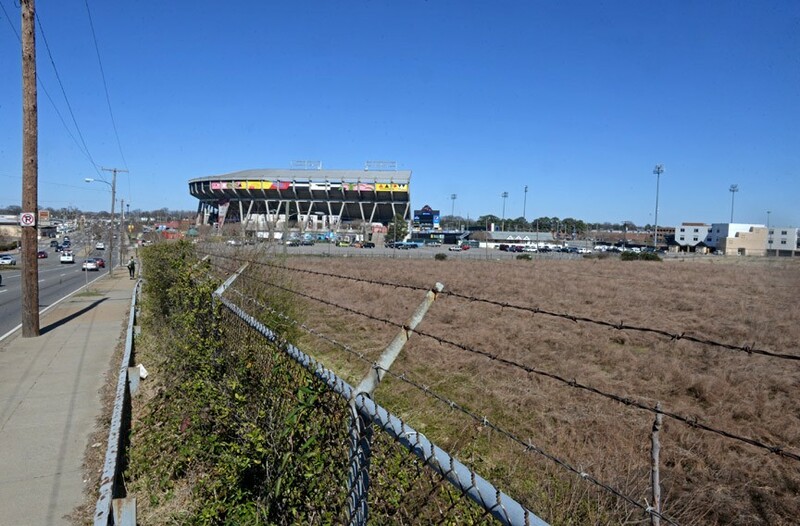 The stadium and surrounding development, it concludes, "can directly sustain 693 jobs annually and contribute $94.7 million to the economy of the city of Richmond." It cites 110 jobs, $15.6 million in economic impact and $100,000 more through sales, meal, lodging and business and professional license taxes. "In addition," it says, "the construction of the baseball stadium and associated commercial and residential properties generates a one-time impact of hundreds of millions of dollars in spending and thousands of jobs in the city of Richmond." One key element of the property has passed the area by — some say for the better. Beginning in 2014, the state started studying how to improve rail service along the 123-mile span between Richmond and Washington. Part of that effort required a decision on train stops locally. Would it be at the Staples Mill Station, Main Street Station, a new Boulevard station — or a combination of those? 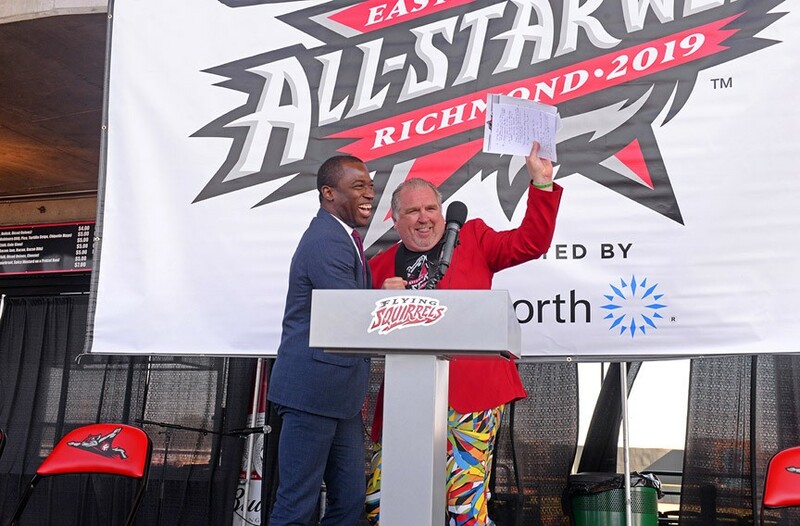 Mayor Levar Stoney with Richmond Flying Squirrels’ Vice-President and Chief Operating Officer Todd “Parney” Parnell during a ceremony to announce that the Squirrels are playing host to the 2019 Eastern League All-Star Week in July. It will feature events including a country music jam at Richmond Raceway, celebrities and the all-star game. 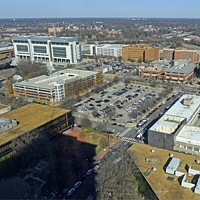 Virginia Commonwealth University's president emeritus, Eugene Trani, and others lobbied for a single stop at the Boulevard area to kick off growth in what he referred to as a new kind of downtown. A report accompanied the idea, called "A Second Center: the Westward Expansion of Downtown Richmond." Not happening, says Jennifer Mitchell, director of the Department of Rail and Public Transportation. Keeping both Staples Mill and Main Street Station "turned out to be the best combination for Richmond," she says — and that's what the state has handed over to the federal railroad administration in its environmental impact statement. Mayor Stoney and his team never embraced Trani's idea. 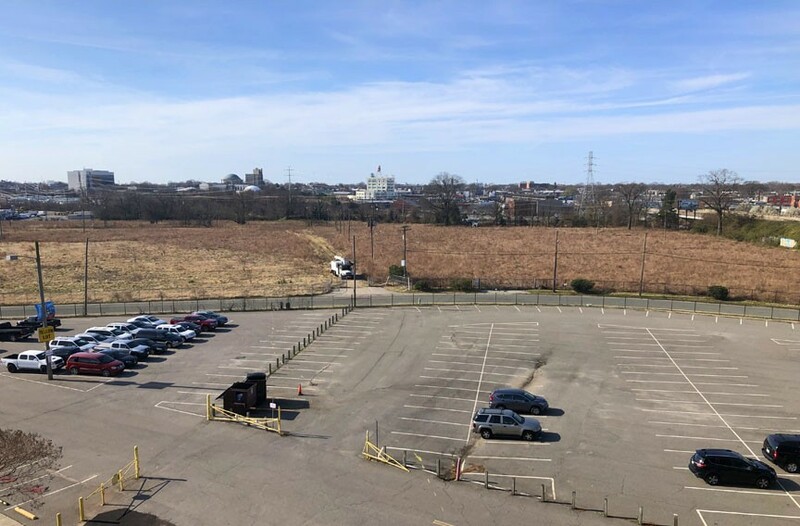 "We're letting a 60-acre property in the heart of the city collect dust instead of generating the next big thing for Richmond to keep the momentum going," says a former city official who asked not to be named. The rail improvements will be a long time coming. First, the Long Bridge must be expanded between Virginia and Washington. That could take another eight to 10 years. And then work on the Richmond segments. The new service won't be high-speed, but it will be more reliable with more capacity, she says. Another development for the property came with the arrival of Levar Stoney as mayor, who brought with him some knowledge of meetings with the Richmond Flying Squirrels through his former job as secretary of the Commonwealth under former Gov. Terry McAuliffe. An agreement was reached between VCU and the Squirrels for the team to stay in Richmond while plans were worked out for VCU to build a new stadium, which would be rented out to the Squirrels. But all eyes are on property now occupied by the state's Alcoholic Beverage Control warehouse next to the Diamond. That entity may be moving, opening up the area for a new stadium, and clearing the tract of land on which the Diamond sits for development. Gray says she asks for updates about Ashe Boulevard every time she meets with the mayor or chief administrative officer, but has received nothing new from them. "But think about what really this would mean to our city's tax base," Gray says. "It would require so little. ... They want to give up 80 blocks of revenue for a Coliseum, but this is already here and happening, and all we have to do is make it a priority."